AUTOMATIC TRANSMISSION, ELECTRIC WINDOWS, AIR CONDITIONING, PARK AID, DVD, LEATHER TRIM, HEIGHT ADJUSTABLE DRIVERS SEAT, SPORTS SEATS, POWER STEERING, STEERING WHEEL RACK ADJUSTMENT, CRUISE CONTROL, TRACTION CONTROL, M SPECIFICATION WHEELS AND DOOR SILL GUARDS, BLUE TOOTH PHONE CONNECTIVITY,TRACTION CONTROL, CENTRAL LOCKING. The E46 is the fourth and extremely popular generation of the 3 Series and is held in high esteem amongst the BMW faithful and fellow car enthusiasts. 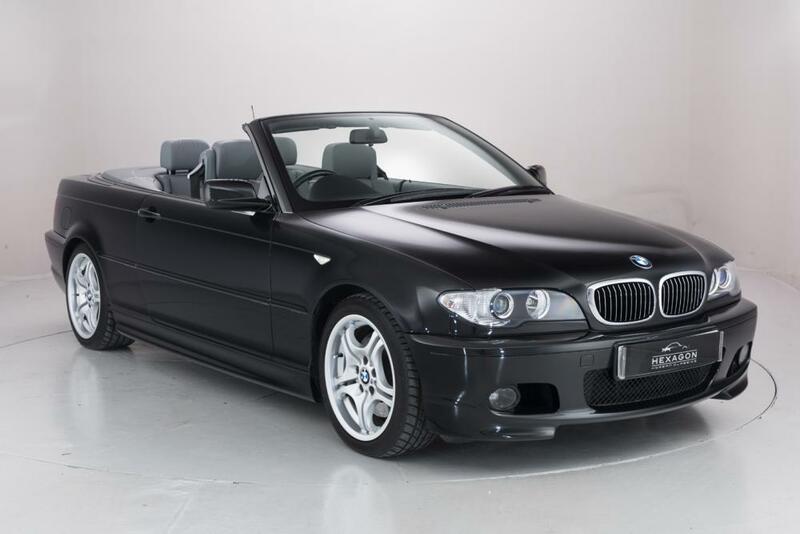 Low mileage examples are becoming harder to source, so it goes without saying that we are delighted to offer this stunning Sapphire Black convertible to our stable. The E46’s general exterior was designed by Erik Goplen and was approved in May 1995, the design was based on the E36 body shell though the emphasis was on improving aerodynamics and increasing the car’s aggressive stance. The 2,979 cc M54B30 power plant was the largest of the M54 variant built and produced 230hp at 5,900 rpm and 220 lb·ft of tourque at 3,500 rpm. Our car is beautifully presented and originally supplied by Sytner Chigwell in July 2004, this one owner car is sold with eleven MOT certificates, a number of expired tax discs and supporting invoices.